Sometimes you simply cannot help but laugh, and those are the times Ricky Gervais preys upon. If you have ever heard him podcast with fellow humour stirrer Stephen Merchant and their patter pawn Karl Pilkington, or if you happened to catch any of the writer-director’s previous television efforts (I’m thinking Life’s Too Short or, to a lesser extent, Derek) you’ll already be aware of Gervais’ innate desire to prod away at that which ought not to be prodded. His brand of toe-curling hilarity gained notoriety via The Office, a post-millennium docudrama that ran for only two series and a Christmas special. In it he played David Brent, manager unextraordinaire, whose lack of social awareness suffocated his clamour for acceptance. People loved The Office, and still do — it won a Golden Globe in 2003, a first for a British production — which makes Gervais’ decision to bring Brent back some 13 years later a risky one. Revisiting royalty can be a dangerous game. And yet you forget about the potential pitfalls almost instantly as we learn of Brent’s plan to take his cringe on the road (hence the title). He ain’t getting any younger therefore now is as good a time as any to chase those rock star dreams. 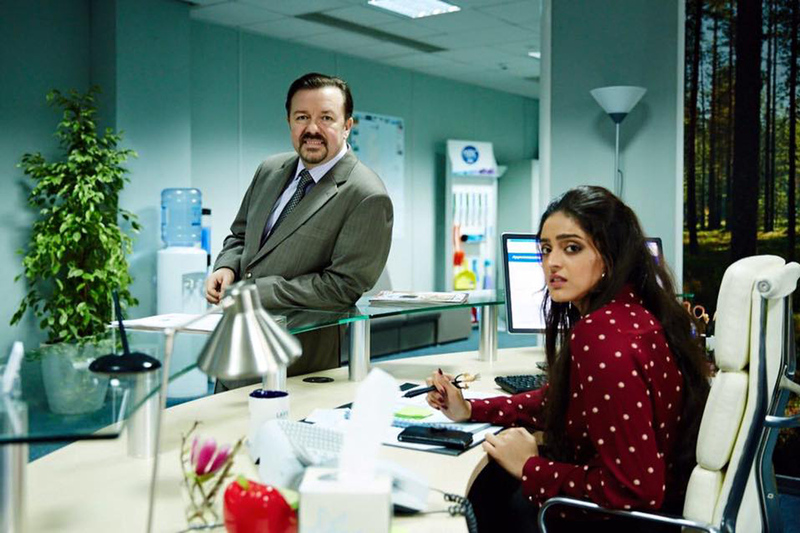 This is a positive because it gives the story more scope, removing us from the office environment that still entraps Brent: nowadays he works as a sales subordinate having fallen down the corporate pecking order. More importantly, it affords Brent new surroundings within which to thrive, new locales outwith the world of laptops and staplers, and new scenarios ripe for brutal awkwardness. Brent decides to relaunch his musical ambitions under the guise of his old band moniker, Forgone Conclusion, only this new incarnation does little but emphasise Brent’s middle-aged reality: his new band mates are a bunch of indie instrumentalists and rapper Dom Johnson (Ben Bailey Smith), whose career Brent has co-opted and unwittingly held back. None of them display any sort of warmth towards Brent, apart from Dom who sort of sympathises with his desperate interior. The others refuse to have a drink with their lead singer after gigs and even fall silent whenever he enters the room. Brent, of course, makes light of the whole scenario, putting this lack of interaction down to his band members giving him, their star man, his own space. And you laugh. You laugh because it’s Brent. Because he attracts wince-inducing guffaws like a garden light does moths. He sings about anything and everything, lyrics often just words assembled in a somewhat rhythmic manner. Or, better yet, lyrics about respecting those with a disability that fail to follow through when sewn together. In Brent’s mind his tunes are supposed to empower their subjects — following a live rendition of “Please Don’t Make Fun of the Disableds”, the singer appreciatively nods towards a man in a wheelchair — though to the naked ear they are offensive. But only to the naked ear, to those uninitiated in Brent lore. Because those of us familiar with his antics know there is a lack of malice. We are never laughing at the subjects of Brent’s songs because he isn’t harvesting them for humour. They are never the target. Whether he genuinely cares about those whom he sings about or whether it’s just a case of adhering to the social justice mantra of the day is irrelevant. 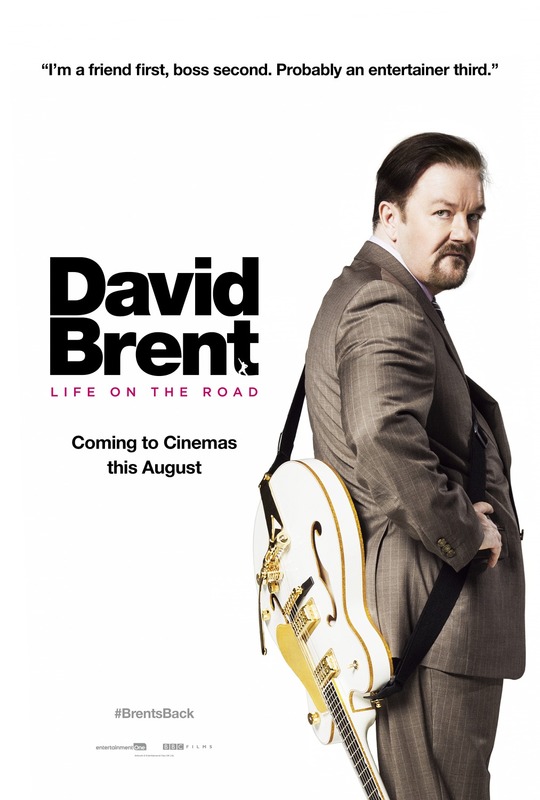 We know how good Gervais is at playing Brent because we’ve seen him do it before. It helps that the character is entirely his own creation, essentially Gervais turned up to 11, but the actor still has to act. The most important factor is timing and Gervais dictates the pace, both in front of and behind the camera. Early on we hear Brent brag about his love for all kinds of females before hesitating and subsequently neglecting black women (presumably because he is so out of touch and fears any utterance of the word “black” will incur racism accusations). The hesitation is pinpoint; we sort of see it coming and yet Gervais still surprises us. There is also his patented Sigh-Laugh, the perfect vocal representation of a man flapping around in comic quicksand and sinking further after each gag. In some instances you can pick out the streams of improv, those moments where Gervais is clearly rambling on, digging Brent an increasingly deeper hole. His co-stars — especially Jo Hartley and Mandeep Dhillon, playing amiable co-workers — do well to keep straight faces (I suspect the outtakes will be worth seeing). The cringe isn’t always humorous. Life on the Road taps into serious issues, such as the effect adverse mental health can have on one’s self-worth. Brent, we learn, has struggled in the time between The Office and now, and that struggle still lingers in the form of fame addiction. He pays for everything, literally buying into a false pretence: numerous pensions are cashed in order to fund the tour and socialising with the band comes at a cost, yet Brent persists, aimlessly wasting money in pursuit of adulation. It makes you wonder why fame appeals to him so much. Part of it, presumably, is to make up for his own flaws. But Brent also wants out, away from an office environment that he no longer recognises. The business world has changed since Wernham Hogg and is now populated by brash, arrogant macho types (you know the sort). Jokes have become fossilised, unless they are genuinely offensive, and self-interest is the new corporate currency. You quickly realise that it is Brent who has given colour to this dingy landscape, albeit wonkily, and his cohorts realise it to. Dom maintains a sense of frustration over his counterpart’s uselessness but is appreciative of Brent’s drive. Ben Bailey Smith, incidentally, pitches the mediator role with great effect. Procuring this authentic sympathy for the man is a fine balancing act, and the film doesn’t always uphold that balance. Notably, a radio interview goes pear-shaped for Brent both within and outwith the walls of the narrative: he is supposed to be there to plug his tour and sell tickets but is instead constantly put down by the station’s nasty host. While in real life it may be true that some radio hosts couldn’t care less about the exploits of their guests (Gervais would know given he worked in the field), they at least play the game and feign interest. No such thing happens here, and the anchor’s contemptuous attacks on Brent feel contrived. But one misstep across 90 minutes is pretty good going. Gervais shows us the difference between using humour as a somewhat misguided path towards acceptance, and using it without underlying compassion — it isn’t funny, for instance, when a band member calls a woman fat, nor is it supposed to be. Fans of The Office will enjoy the awkwardness (I didn’t miss the likes of Martin Freeman and Mackenzie Crook, though others might). There is also a heartfelt message bubbling below the comedic furore, one that encourages us to try as Brent does, but to value ourselves in spite of any subsequent successes or failures. “I like making people laugh. I like making people feel,” says the eponymous giggler. Sometimes you simply cannot help but laugh. And sometimes you simply cannot help but feel, even for David Brent. I missed Stephen Merchant and it was slow at times, but there was some strong perception and I think they nailed the fact that the office environment really is a different place to where it was in the 90s. I always miss Stephen Merchant whenever he isn’t on my screen but I enjoyed the total separation here. Indeed, thought the office environment switch-up was handled very well. Hey Martin, thanks a bunch. Haven’t been around much lately; I’ll catch up on some of your reviews soon. No worries Adam mate!! Thank you very much I’d be very grateful!! Keep up the good work with your reviews man! !